JBC Tools T245-A General Purpose Handle. 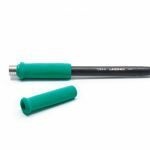 This JBC Tools T245-A soldering iron handle for general purposes features a soft foam grip which provides thermal insulation. Is perfect for both SMD components and for jobs with high power requirements (e.g. ground plane soldering). Purchase JBC Tools T245-A Soldering Handpiece sold by Howard Electronics Today!